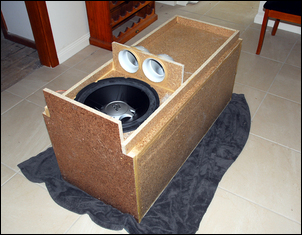 Prior to that, in Sound in the Lounge, Part 2 I’d built and installed the twin 15 inch under-floor subwoofers. So now it’ll all be really easy – just connect-up the speakers and away I go, right? Nope. Most people would at this stage use a home theatre amplifier, a device that runs lots of amps inside the same casing. A home theatre amp would also likely have a subwoofer amp and internal, adjustable crossover. 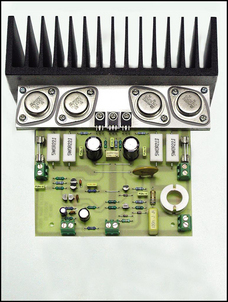 · The Silicon Chip design has vastly better distortion and noise figures than typical home theatre amps. Also, when I built it, I chose to use generous heat-sinking and switchable fan cooling, so if required, it can run continuously at full power. · I already had the amp and so it would cost me nothing extra. · The system was never being set up for home theatre, so two channels should be fine. So, a single two-channel amp it was. Furthermore, I didn’t want to philosophically think of the underfloor woofers as even being subwoofers. I wanted instead to consider the speaker system on each channel as comprising a 15 inch woofer, 8 inch mid/bass and a dome tweeter. To put this another way, I wanted seamless integration between the drivers – not the “thump, thump – oh, there’s the sub working” approach that so many choose to use. The first step was to divide the audio signal to suit the different drivers. Crossovers are passive electronic devices that split the frequency range up so that the different drivers are fed what is appropriate for them – treble to tweeters, for example. Passive crossovers are made up of inductors and capacitors. This type of crossover goes in the speaker feed – that is, after the amplifier. There was no point in re-inventing the wheel, so I used the original Wharfedale crossover to feed the tweeter in my new-shaped wall enclosures. And, as I said last issue, with the mid/bass getting the full signal and the crossover feeding the tweeter, the wall speakers sounded very good. But how to integrate the 15 inch JBLs? 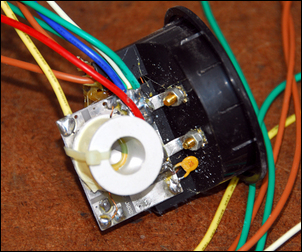 After looking around carefully I decided to use a car component – a Clarion EQS746. This unit has excellent audio specifications, adjustable pre-amp levels, and a 7 band equaliser. For the performance, it’s also vastly cheaper than anything I could find that’s actually designed for home sound systems. Run off a 12V plug pack it works very well with no audible hum or hiss. The next step was to set the phasing correctly. 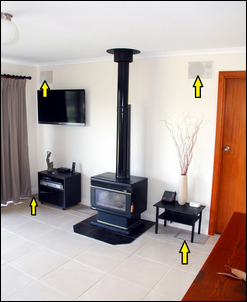 Speaker phasing is about having the cones of the speakers all push forward at the same time. If one cone is pushing forward, and the other cone is pulling backwards, then the strength of the created pressure wave is diminished. Phasing is particularly important in gaining good bass response. However, and here is one of the tricky bits, depending on the design of the speaker crossover, the phase of the speaker may be changed – positive may not actually be positive. 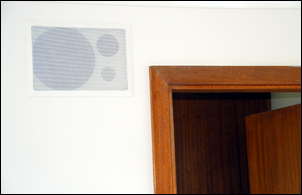 Furthermore, what about the behaviour of the speaker enclosures – here on each channel, one is under the floor pushing waves through a small connecting extension, and the other is flush with the wall? Do the waves then stay in phase? With the system set up as described above, I did a frequency sweep with the signal generator, driving just one channel. At this stage the speakers were phased as indicated by their polarity of connections – positive on amp driving positive on each of the drivers. But set up in this way, there was a very distinct hole in response at 70Hz. Initially I was flummoxed – was there a problem with either the wall or floor speaker? With the system reproducing a constant 70Hz from the frequency generator, I disconnected the floor speaker and lo and behold, the bass suddenly became stronger! This could only be the case if one speaker was cancelling the other – so I swapped the polarity of the floor speaker. Then, when the floor speaker was connected, the bass at 70Hz became stronger and not weaker. A sweep with the sig generator showed that response was now fine from 1000Hz down to 25Hz. When setting-up the system I found I had to make a fundamental decision.... and come to a sobering realisation. The realisation was that I think for a long time I have been listening to one-note bass. The decision was to set the woofer levels so that they reproduce only the bass that is really in the music. But it took a few days of playing with the set-up to reach those ideas. Then I found that when I listened to the music, and not just the bass, the pleasure of listening was hugely diminished. The thump-thump-thump simply didn't reflect what the artist intended: it was as silly as turning the treble way up. So I set the big speakers at a level I thought seemed right - and listened to a ton of different music. Sometimes, music I expected through previous listening to have a lot of bass had little - I'd got used to listening to a resonant (ie single frequency) bass that was much emphasised. Other times, music I thought hadn't contained much bass had in fact much deeper-pitched bass than I had previously heard (ie my old speakers couldn't reproduce it). Set up in this way I found another aspect I liked. The system sounded good, even when played quietly. Rather than booming bass at higher listening levels and a reedy, weak sound at lower levels, it sounded full-bodied and natural at different loudnesses. Vocals also sounded fine - in many systems, especially those with an over-active sub-woofer, male vocals become unnatural. I then read a comment in an amplifier manual that summed up my ideas: you should not be able to tell when the sub-woofer is contributing. In my case, I should not be able to tell when the 8 inch two-ways are running out of puff and the 15 inch drivers are taking over. Put that way it seems obvious. While the system was a lot of work to design, build and install, it cost relatively little. Of course some of that low cost is related to the fact that I already had an amplifier, and the in-wall speakers used components from speakers that again, I already had. But even taking those aspects into account, you could buy all-new components and build the complete speaker system, including the underfloor speakers, for less than I see plenty of bare in-wall speakers being sold for. And the installation costs? 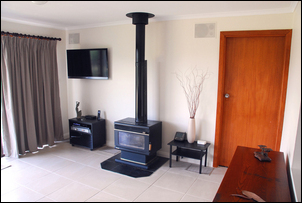 Because I was already floor tiling and painting, the extra cost of installing the speakers was near zero – I didn’t have to buy a single extra item. So how does it all sound? I don’t want to surprise you – but in terms of how it sounds, I have heard better. Pardon? Well, over the years, I have listened to some very expensive systems – some costing tens of thousands of dollars. And my system does not sound as good as those. Especially in the creation of a sound stage and stereo imaging, having the bass drivers away from the mid / bass drivers and tweeters is always going to be a negative. And after all, all the drivers were quite cheap and the amplifier, although extremely clean, is not hugely powerful. But when the system is considered in terms of (a) its total cost, and (b) the fact that the speakers are completely hidden – well, in that case, the system is quite fantastic. Quality reproduction with nothing to see – it’s uncanny.